21 January 2019 --- The harsh environment protection benefits of GRP-based enclosures are now available for hundreds of new outdoor applications with the launch of new Type 4X certified enclosures and cabinets from Intertec. The new range adds many more standard enclosure and cabinet sizes to the Type 4X rated choices available - all of which offer the exceptional anti-corrosion and insulation properties of Intertec's composite-GRP (glassfibre reinforced polyester) construction. Moreover, the choices now extend to custom GRP enclosure shapes and sizes; this service allows engineers to optimise size and shape to precisely suit equipment content and layout, and minimise surface area - thereby securing optimum thermal performance. Intertec specialises in enclosures for outdoor applications, which are all fabricated using advanced GRP materials. 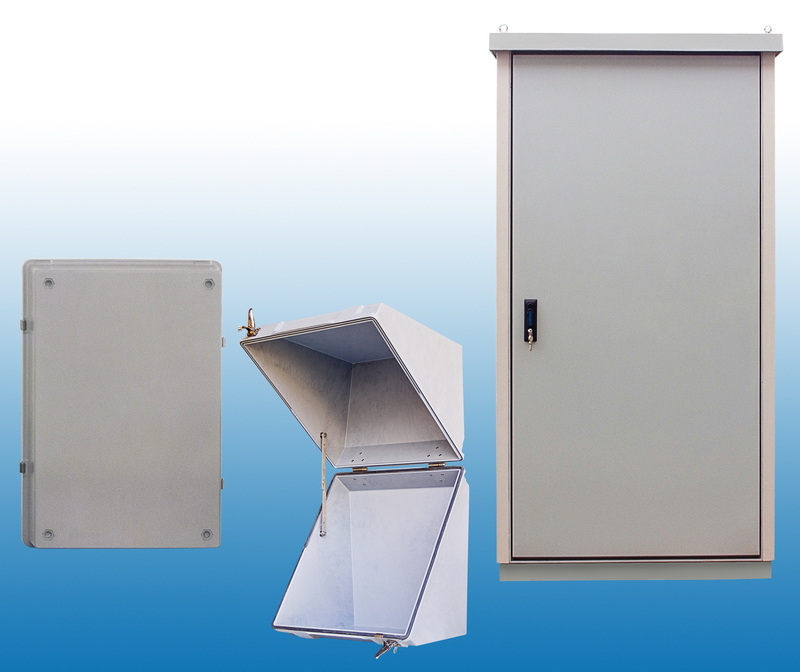 GRP-based Type 4X enclosures are ideal for protecting field-based electrical and instrumentation equipment sited in marine and coastal areas, where the presence of salt in the atmosphere can severely damage traditional metal enclosures and shorten their service life significantly. Intertec’s GRP is highly stable and virtually immune to the affects of salt and most common petrochemicals and airborne pollutants. GRP has a similar strength to stainless steel but is about 75 percent lighter, which helps lower transport costs and simplifies many installations. Intertec's Type 4X enclosures also include uniquely efficient insulation thanks to a proprietary triple-layer composite construction that 'sandwiches' advanced insulation material between sheets of GRP. Compared to metal enclosures and cabinets, which users sometimes need to insulate themselves using ad-hoc techniques, Intertec's enclosures come with embedded insulation providing near-perfect thermal performance - avoiding 'thermal short cuts' between interior and exterior that can lead to cold-spots and problems from condensation. This aspect makes Type 4X GRP enclosures and cabinets ideal for applications in the harshest of environments such as the Arctic, Alaska, and any other region or application environment that must deal with difficult conditions involving ultra-cold or -hot temperatures. Intertec has offered a selection of Type 4X enclosures for many years for smaller-scale panel/wall-mounting or freestanding (pipestand-mounting) outdoor equipment protection applications. The company has now added more enclosures and larger rectangular cabinets to the offering. The new range can be broken down into two main categories. The first is two-part enclosures. One Type 4X style offers two part enclosures with a diagonal opening - for simple and ergonomic access to housed equipment. There are five standard choices offering volumes from 87 to 277 litres. A second style in this category is rectangular two-part panel-mounting enclosures with one part acting as a door and the other housing the installed equipment. There are 11 choices of this style offering volumes from 20 to 250 litres. In addition to these standard products, Intertec can now provide Type 4X enclosures in custom shapes and sizes, up to maximum volumes of 980 liters for diagonal opening styles, and 500 litres for rectangular box styles. The second category is rectangular floor- or wall-mounting cabinets, with single doors. These can now be provided in Type 4X variants in a wide range of standard sizes up to maximum heights of 214 cm, widths to 110 cm, and depths to 110 cm - a maximum volume of 2590 litres. Further specification choices include two styles of construction for applications involving lighter or heavier equipment loads. 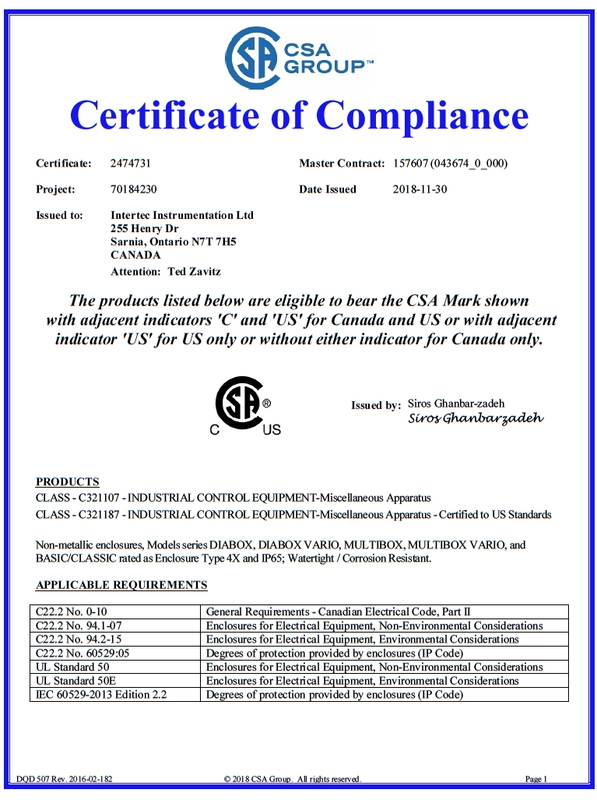 The independent testing to NEMA's Type 4X specification was performed by the Canadian Standards Association (CSA). 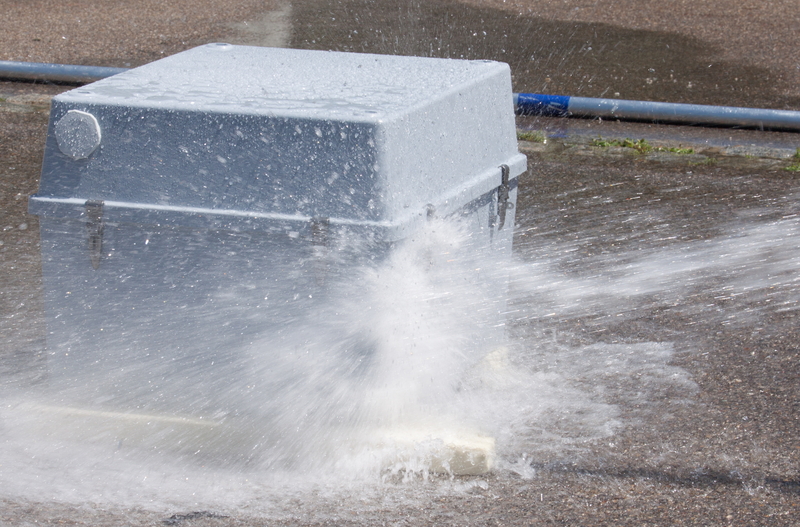 To comply with the CSA 22.2 94.2-07, UL50/50E and NEMA 250 standards, Intertec's Type 4X enclosures must prevent the ingress of dust and be watertight against rain, sleet, snow, water splashes and hose-directed water. They must also be undamaged by the formation of ice on external surfaces, and provide additional protection against corrosion. The protection level is broadly equivalent to the international IP65 rating, but tests ingress protection using much more powerful water jets - at approximately 20 times the flow rate required by IP65 (and over twice that of the higher standard IP66). All of Intertec's new Type 4X enclosures are also certified to the IP65 standard. The harsh environment protection benefits of GRP-based enclosures are now available for many new outdoor applications with the launch of Intertec's Type 4X certified enclosures and cabinets. Independent testing to NEMA's Type 4X specification was performed by the Canadian Standards Association (CSA) for Intertec.